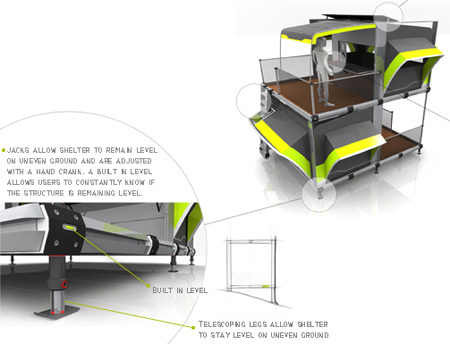 Uber Shelter is an amazing concept for a portable housing unit that would help people in meeting their immediate shelter requirements created by disastrous events. 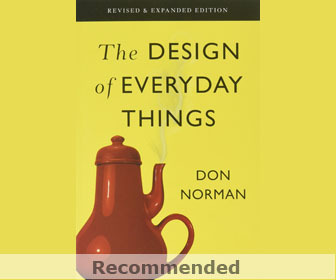 This great concept is designed by Rafael Smith. 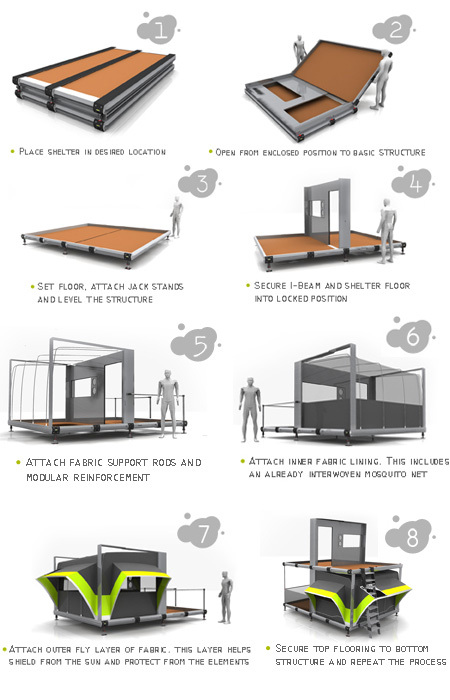 This shelter can be very quickly transported and reassembled with just few necessary tools and offer victims with individual living space. 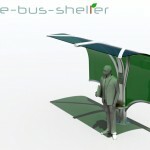 The best thing about Uber shelter is that it is made from recyclable and reusable materials. Around two to three personal rooms can be created in this shelter. 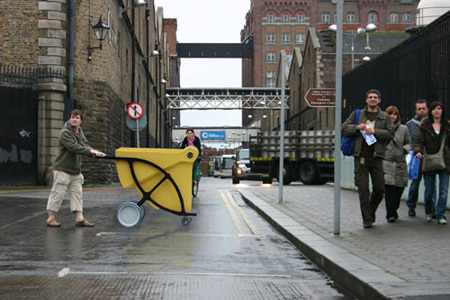 I believe these types of concepts are very useful for unpredictable disasters. 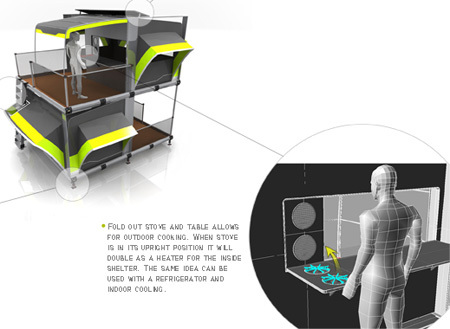 1) Easily transportable, collapsible and able to be shipped flat. 2) Built of recyclable materials and have the ability to be reused. 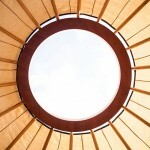 3) Easy to erect and assembled with few or no tools. 4) Amenable to infrastructure?can be used as a basic structure, but have the capabilities to upgrade and implement modern conveniences. Über is shipped flat to allow for transport via air sea and land. 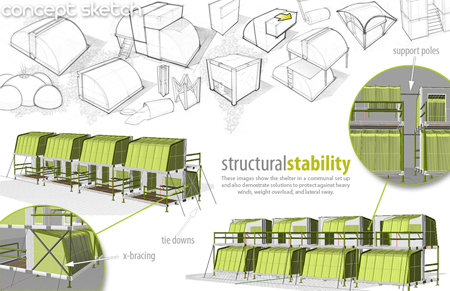 All components that create the modular living unit are stored inside the shelter in its collapsed position during transport. It is then taken apart and assembled on location. When it is no longer needed, it can be dismantled, packed flat again, and moved to the next disaster area. 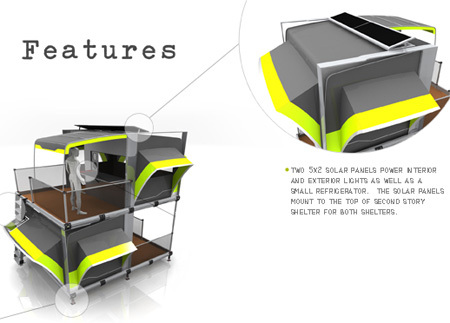 The aim has been to design a shelter that is compatible with the current system used in refugee camps and emergencies by organizations such as the UNHCR (United Nations High Commissioner for Refugees). Every camp is different since every situation is different. In some cases proper design of a camp is not possible because refugees have already settled on a site. Uber has been designed to adapt to different situations, terrains, and climates. Camp needs are addressed in phases. Phase one is to meet the basic needs of the people, providing them with the bare essentials. When there is more time, funding, and personnel, phase two provides camp residents with more pleasant solutions and conveniences. For example, phase two would include building an outhouse, rather than having a defecation field or trench. This shelter is delivered in the same fashion. 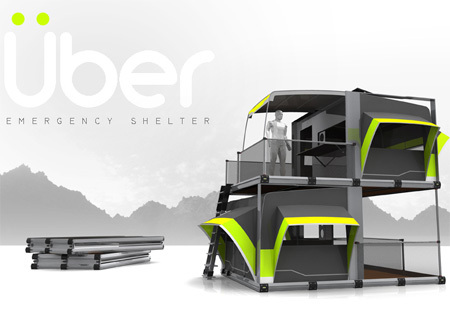 When the initial crisis occurs, Über is shipped as a base unit to meet the initial need for shelter. When the camp is ready for phase two, a separate upgrade package is shipped and added into the shelters units to provide conveniences (electricity for light, compact stove and refrigerator). 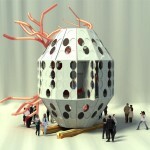 This entry was posted in Architecture, Designs and Concepts. Tagged as disaster area, disastrous events, modern infrastructure, personal rooms, portable housing, reusable materials. 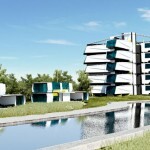 I am a 16 year old AS Level student studying at a school in Essex and i must say i am quite astonished by this design. On behalf of my classmates and i, we would like to say that if someone were to go ahead and manufacture such a design, we would all hastily buy one! The idea of multiple levels helps to maximise the space. If, instead, there were two separate, single level, structures next to each other it would take up twice as much floor space to accommodate the same number of people. A second level makes use of the space in the air above a shelter. we think its amazingly awesome. please email me if this product goes on market. 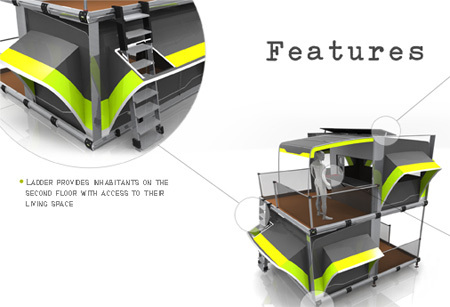 Imagine camping with this instead of a tent… its simply amazing. Dont think it would be cheap though but… you never know. 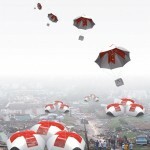 Great invention of such emergency shelters. I really like that. Since I am from Disaster Management and Securities this thing has contributed to my knowledge. Hi Im Pernilla from Sweden, im looking for shelters! Im really impress of this shelter. Is it possible to get in contact with the designer??? do gimme a buzz on my email id. I'm very much interested in this. Is it available? Can I get any contact information? what is this made from and how much would this cost? I would be interested in discussing some innavative ideas for this structure. could you email a contact or more info, Weights, sizes, etc. I want some of these so badly. I am buying some land & these would be great not only for guests, but for assisting other people in need (my husband, my father-in-law, & I are always helping people, bringing them home etc;). This way, they would have a space of their own, a bit of privacy, & a feeling of having a home of their own even if it's only for a little while. It would help them see how wonderful having your own place feels & motivate them to strive to better themselves (that's really for the ones who are capable of bettering themselves). Plus, it'd also be great fun for the grand-kids & their friends as well as all of my great nieces & nephews. It's like a kids' camp at our house every summer as it is, this would just make it that much more fun for them. Awesome awesome idea/invention. Utter genius!!! 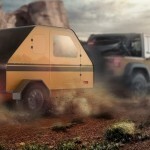 I will buy one if they go up on the market let me know if this ever happens! How can i get one &i much is it??? After these past few days with hurricanes in Texas, Florida, Puerto Rico and Virgin Islands and the earthquakes in Mexico, these would be needed RIGHT NOW!! 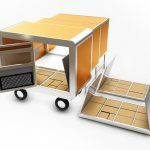 I am an entrepreneur that deal with assistance in natural disasters and since these would be easier to ship and stackable than some I’ve seen so far, this would be great to get for such events. I and a group of others wish to purchase a large quantity of these so please send me more Info and the cost for them. We already have portable restrooms and shower stalls that can be placed into the area of each 5 stacked housing areas, just need the housing. Theses are really great. I wish the military lived like this. It’s smart. 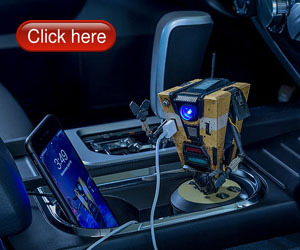 I too would be interested in how to get one. Please let me know. These would be great for my back yard!